Fleeing the murderous Pol Pot regime, Cambodian refugees arrive in America as at once the victims and the heroes of America's misadventures in Southeast Asia; and their encounters with American citizenship are contradictory as well. Service providers, bureaucrats, and employers exhort them to be self-reliant, individualistic, and free, even as the system and the culture constrain them within terms of ethnicity, race, and class. 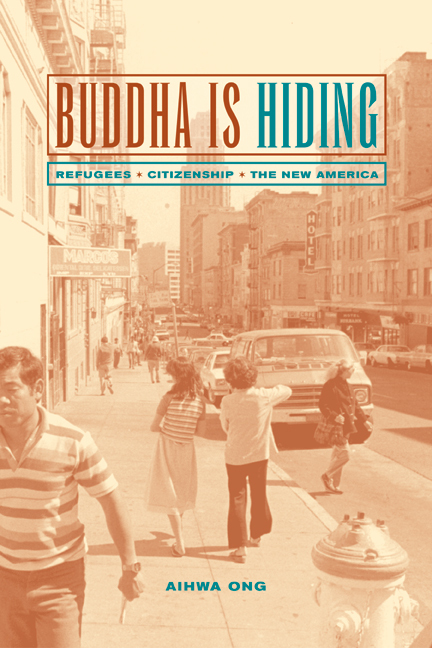 Buddha Is Hiding tells the story of Cambodian Americans experiencing American citizenship from the bottom-up. Based on extensive fieldwork in Oakland and San Francisco, the study puts a human face on how American institutions—of health, welfare, law, police, church, and industry—affect minority citizens as they negotiate American culture and re-interpret the American dream. In her earlier book, Flexible Citizenship, anthropologist Aihwa Ong wrote of elite Asians shuttling across the Pacific. This parallel study tells the very different story of "the other Asians" whose route takes them from refugee camps to California's inner-city and high-tech enclaves. In Buddha Is Hiding we see these refugees becoming new citizen-subjects through a dual process of being-made and self-making, balancing religious salvation and entrepreneurial values as they endure and undermine, absorb and deflect conflicting lessons about welfare, work, medicine, gender, parenting, and mass culture. Trying to hold on to the values of family and home culture, Cambodian Americans nonetheless often feel that "Buddha is hiding." Tracing the entangled paths of poor and rich Asians in the American nation, Ong raises new questions about the form and meaning of citizenship in an era of globalization. Aihwa Ong is Professor of Anthropology and of South and Southeast Asian Studies at the University of California, Berkeley. She is the author of Flexible Citizenship: The Cultural Logics of Transnationalism (1999) and Spirits of Resistance and Capitalist Discipline: Factory Women in Malaysia (1987), and the editor of Ungrounded Empires: The Cultural Politics of Modern Chinese Transnationalism (1997) and Bewitching Women, Pious Men: Gender and Labor Politics in Southeast Asia (California, 1995). 10. Asian Immigrants as the New Westerners?